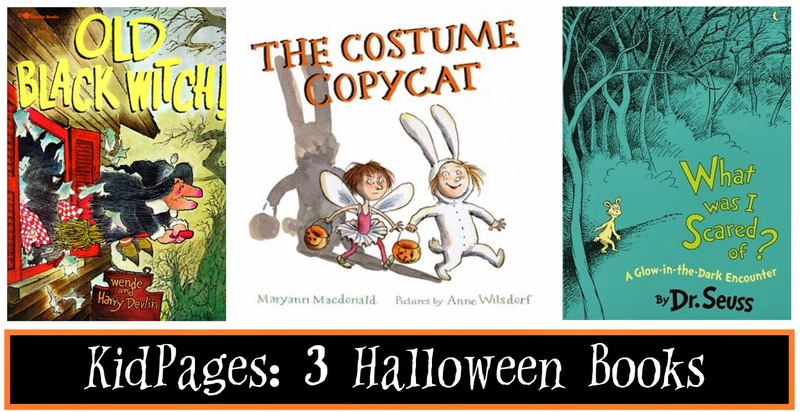 Every October we check out a lot of Halloween-themed picture books from the library. I'm sure your house is filled with them too. My children prefer scary (of course, they don't know what real scary is), and I prefer cute. This little list is a mix of both (but all of them end with cute). 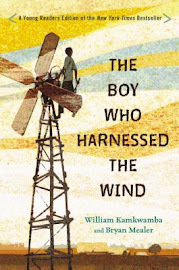 We read this book for the first time yesterday. Yes, yesterday. At the time, I already had the beginnings of this post in my head. For the sake of keeping the post a decent length, I planned on limiting myself to three books (which, you can see, I stuck to). Originally, one of the three books was going to be Cranberry Halloween, which we read earlier in the month and really liked. But then we read this one, and we liked it even more. Since they are both written by Wende and Harry Devlin and definitely have a similar feel, Cranberry Halloween got cut (but you should still go check it out!). Old Black Witch is living in an old, abandoned house when Nicky and his mother purchase it and begin the process of fixing it up and turning it into an adorable little teahouse. Old Black Witch is outraged: "There aren't many old, broken-down houses left, you know." Nicky's mom kindly offers the attic room to Old Black Witch, which suits her fine since it is the only part of the house still occupied by cobwebs and bats and layers of dust. When the teahouse opens, Old Black Witch makes occasional appearances, and all of the customers find her quite charming--even though she is just as ornery as ever. However, her orneriness proves to be a valuable asset when two thieves decide to break in and steal from Nicky and his mom. The Old Black Witch will have none of that! 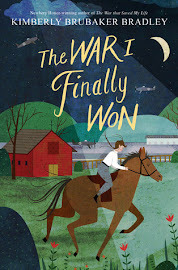 If you've never read anything by Wende and Harry Devlin, then you're missing out on a rare treat. Theirs is a unique brand of storytelling: at times simplistic and at other times detailed with the unmistakable charm of the 1960's upon it. It's on the wordy side of picture books for sure, but even two-year-old Bradley had no trouble sitting through it. The witch is depicted as short and stout with a red face and a big nose. There is a certain quirky cuteness about her that is only intensified by her prickly personality. She's like the typical old lady who lives across the street: she hates children (and people in general), but she's as loyal as they come. I've read enough mediocre Halloween books to be able to spot one a mile off. But The Costume Copycat did not turn out to be even half as mediocre as I was expecting. No cut-and-paste dialogue. No Halloween classroom parties. No redundant rhymes. Instead, what I found was a sweet story about two sisters: Angela (the younger one) and Bernadette (the older one). Every year, Bernadette picks just the right costume to be a smashing success in the neighborhood. 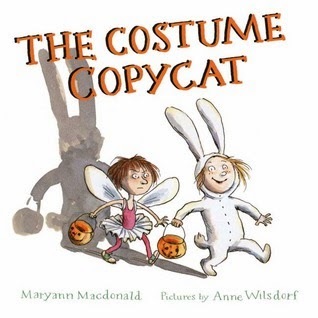 And every year, Angela picks up Bernadette's costume from last year (in the hopes of enjoying some of the same popularity as Bernadette the year before) but finds that for some reason she just doesn't seem to have the same effect on people. But then one year, Bernadette's hand-me-down costume (a gypsy) won't fit Angela, and so she has to come up with her own. She discovers (as I'm sure you can guess) that her own ideas can be pretty amazing, too. The thing that makes this story so delightful is the stark (and very amusing) contrast between Bernadette's and Angela's years with the same costume. The year that Bernadette is a white rabbit, their neighbor, Mrs. Walker, exclaims, "Oh, look at the cute little bunny!" and insists on taking two pictures of Bernadette. The next year, it rains all evening, leaving Angela a wet and muddy and bedraggled rabbit. Mrs. Walker, not unkindly, tells her, "You're a wonderful rat." For almost the entire story, Angela is consumed with jealousy while trying desperately to have her moment in the sun. At the end, when she finally feels noticed and appreciated, it is amazing how she instantly stops being so selfish and begins using polite words and shows love for Bernadette. Just a little self-confidence goes a long way. It definitely makes me want to look out for those kids (perhaps living within the walls of my own home?) who are feeling overshadowed by an older sibling; I want to recognize their strengths and let them shine in their own way. If you had asked me ten years ago what I thought of Dr. Seuss, I probably would have said something about fond memories in regards to green eggs and ham, but other than that, not a lot of affection or admiration. In fact, I really didn't think about him much at all. I have since changed my tune. While I don't think I'll ever love The Cat in the Hat, I now count some of his books among my most favorites (I think I could read The Grinch Who Stole Christmas a dozen times in December and not get sick of it). The more I read of Dr. Seuss, the more I love him. We first read this book, hmmm, probably over a year ago. But I checked it out from the library again this month and was surprised by what a perfect Halloween story it is: a creepy pair of green pants with nobody inside them? pants that follow around an unsuspecting and innocent creature? pants that only come out at night? Definitely scary. So scary, in fact, that my two-year-old was led to exclaim as we turned the page, "Oh no! Green pants!!!!!" It ends up being that the green pants are just a little lonely and in need of a friend, which isn't so much scary as it is very weird. But you know what? It works. The reason why I can't get enough of Dr. Seuss is because he is so fun to read aloud. Seriously. Try this stanza: "I ran and found a Brickel bush. / I hid myself away. / I got brickels in my britches / But I stayed there anyway." Brickels in my britches? Tell me that line alone doesn't just make you want to read the rest of the story. It's almost therapeutic for me to read his rhymes. Once I begin, the predictable, undulating meter pulls me in, and I am content to ride it out to the end. You may have noticed from the cover that this is a "glow-in-the-dark encounter." 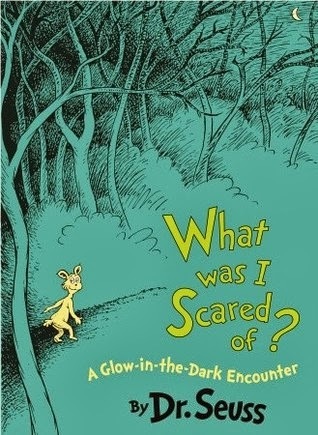 Does anyone else think that a glow-in-the-dark book is like the dumbest idea ever? I mean, it's almost always closed up tight; the only time it sees the light of day is for the brief 30 seconds spent on its page; plus, who ever heard of reading a book in the dark? We have yet to look at this book in the dark because it would take so much time to get it ready. That's what we've been reading lately. Have you found any new favorites this month? These look fun! I hadn't ever heard of a glow in the dark book until I read some blog post over a year ago with someone who loved them growing up. She would read them with a flashlight in bed. 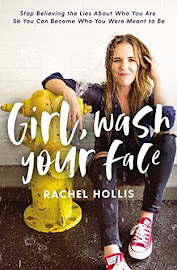 I don't remember what was I scared of very well, but the books she was describing sounded more like you'd read the pages and then flip off the flashlight for like extra clues or something. That sounded cool. I love this list. I don't have any Halloween favs yet. Do you guys watch Halloween inspired movies too? 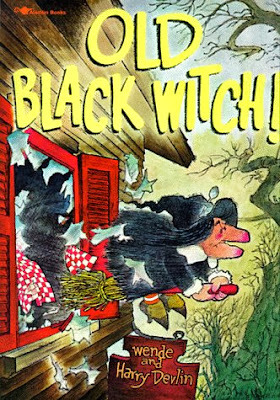 We had Cranberry Halloween (and love the Thanksgiving one, too) but I had never heard of 'Old Black Witch', I'll have to see if our library has it. Thanks!